I have written a couple of times about the issues of removing signatures from swords, for example here and here. Now in these two examples, the signature was removed due to lack of knowledge in the one case, and due to criminal activities in the other case. This time, I would like to introduce a blade where not its signature per se but a kinzōgan-mei attribution was removed, and that not because of ignorance but more as a correction, thus this title of this post. The blade in question is a tachi that has been shortened to a katana and that was tested by the famous early Edo period sword tester Nakagawa Saheita (中川左平太, ?-1653), cutting with it with just one hand through a body (katate-dō, 片手胴). At the time the cutting test was performed, the blade was attributed to Rai Kunitsugu (来国次) and inlaid so in gold on the other side of the nakago. The blade is of quite an elegant shape, tapers noticeably, keeps despite of the ō-suriage a deep sori, and ends in a ko-kissaki, or a very compact chū-kissaki if you will. It shows a fine and densely forged ko-itame with plenty of ji-nie and a ko-nie-laden suguha-chō to slightly undulating notare with a wide nioiguchi that is mixed with ko-gunome, a few ko-midare elements, sunagashi, and small yubashiri. The bōshi is sugu and shows a ko-maru-kaeri and a bōhi is engraved on both sides which runs with kaki-nagashi into the tang. Now Rai Kunitsugu is known as a Rai smith who incorporated more than his school colleagues the Sōshū tradition and so a blade like here with such a dense ko-itame and a calm suguha-chō is atypical for him. This was also recognized by the NBTHK when the blade passed jūyō in 1975 and the kinzōgan-mei attribution (not the cutting test and the information on the owner) was put in the certificate with reservation, i.e. as to kinzōgan-mei ga aru (と金象嵌銘がある). 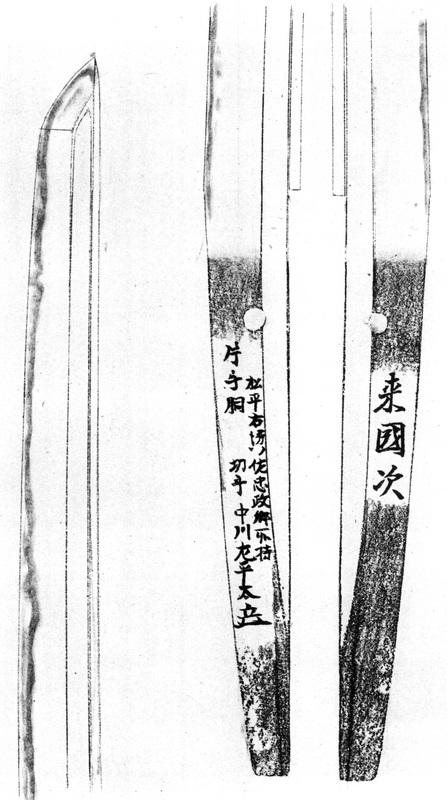 The state of the blade as it passed jūyō is shown below. Two years later, the blade passed tokubetsu-jūyō, and here comes the part which this brief article is about. As you all know, you just don’t submit a blade for tokubetsu-jūyō because you are in a good mood. There are high chances a blade may not pass and it also has to be assessed if such a submission makes sense from an economical point of view. In short, some blades are strong candidates whilst with others more or less barely passed jūyō and it is better to save the money/hassles/time to opt for tokubetsu-jūyō. So, you have to decide case by case. Here at this sword, the owner and probably experts he asked for advice must have recognized its quality and its chances to pass but I guess no one was happy with the period attribution to Rai Kunitsugu. As mentioned, even the NBTHK had reservations when they had awarded it jūyō status two years before. So ultimately it was decided to have the kinzōgan-mei removed and submit again. I already told you that it passed tokubetsu-jūyō, and it did so with the attribution “Den Awataguchi Hisakuni” (伝粟田口久国). Well, quite nice result if you ask me (don’t get me wrong, a Rai Kunitsugu attribution is not bad either). The NBTHK justifies its attribution as follows: “The shallow suguha-chō with its strongly sparkling nie, the densely forged ko-itame, and the very clear steel reflect very well the typical characteristics of this school,” i.e. Awataguchi. 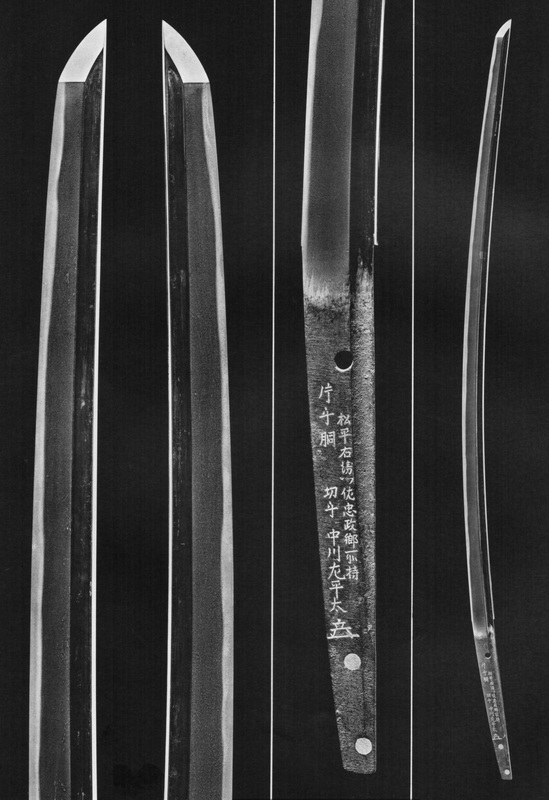 The state of the blade as it passed tokubetsu-jūyō is shown below. Last but not least some info on the previous owner of the sword who is mentioned in the kinzōgan-mei as: “Matsudaira Uemon no Suke Tadamasa kyō shoji” (松平右衛門佐忠政卿所持), “owned by Lord Matsudaira Uemon no Suke Tadamasa.” Tadamasa is better known under his name Kuroda Tadayuki (黒田忠之, 1602-1645) who was the second Kuroda daimyō of the Fukuoka fief (福岡藩) of Chikuzen province (see picture 3) and son and heir of the famous warlord and daimyō Kuroda Nagamasa (黒田長政, 1568-1623), fathered with his second wife who was an adoptive daughter of Tokugawa Ieyasu. 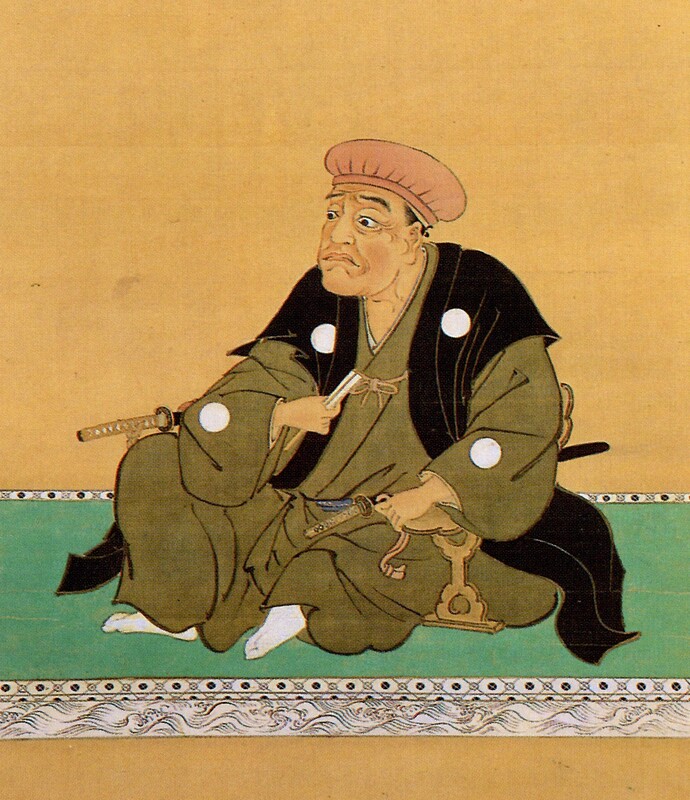 Tadayuki participated in his first battle when he was just twelve years old (or 13 according to the Japanese way of counting), leading an army of about 10,000 men into the Ōsaka Winter Campaign in 1614. Tadayuki went to Ōsaka instead of his father as Ieyasu had made Nagamasa caretaker of Edo Castle at that time. To go into this battle, Nagamasa presented his son with the nanban-kabuto with golden fern maedate he had received from Ieyasu at Sekigahara. When Tadayuki succeeded as head of the Kuroda in 1623, he received from Ieyasus’s successor Hidetada (徳川秀忠. 1579-1632) the character for tada (忠) and successively took the names Tadanaga (忠長), Tadamasa (忠政) (the name that is mentioned on the sword), and Tadayuki. Incidentally, up to that granting of the tada character, he went by the name Mantokumaru (万徳丸). After Ōsaka, he also fought in 1637 in the Shimabara Rebellion and died 1652 in Fukuoka Castle. Last but but not least, and kind of a coincidence considering the new attribution at tokubetsu-jūyu, Kuroda Tadayuki owned “another” Awataguchi blade. It is a tantō by Awataguchi Norikuni (粟田口則国) which is shown in picture 4 and which is today designated as a jūyō-bijutsuhin. He had once received it as a gift from the Tokugawa family, possible at the time he received the tada character. Great article! Fascinating sword with great provenance. As someone into antique arms but outside the nihonto community I find the practice of altering old tangs hard to understand though. Even if the attribution was wrong, it is a period attribution and thus part of the legitimate history of the sword, which is now lost on the actual piece. Not to mention you now have a patch of fake patina on a tang that lost some weight and thickness. A severe alteration, especially for a piece deemed so important. Unthinkable in any collector’s culture but Japan, who otherwise have one of the most amazing track records of preservation in the world! I hope they will one day abandon this practice.